The third installment of Momento Demento’s flagship compilation series brings you the “other side” of the Mo:Dem Fesstival sound as compiled by Val Vashar. Because we firmly believe in the words of Zappa that “writing about music is like dancing about architecture” we’ll leave you to establish exactly what kind of music this compilation contains. We only hope that you will join us on a magical floor of Mo:Dem Festival and share that familiar feeling when rays of sunshine caress your face and the smell of dust is filling your nostrils or when you’re squishing the soggy mud between your toes and cold raindrops are cooling your sweaty body… and you just can’t stop dancing. See you on the dance floor! Mastered by EVP at Wild Mastering. Artwork by Android Jones, graphic design by Macro Zeta, and photo by Marko Gverich. MP3 Download | FLAC Download | WAV Download · Download count: 19,697. Really liked the last, downtempo-ish, track. Yeah, the last two Modem albums rocked with hypnotic, fast moving dark-psy and forest tracks. This one is a slower paced, zenonesque-based installment. I guess it will do, in a pinch. Hey, it’s free!! If you see the line-up for MoDem 2014 you would see the Liquid Level on it. I really do not see philosophic difference between Master Margherita’s track and this one. Btw. 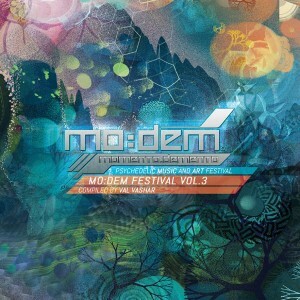 as it was written this compilation “brings you the “other side” of the Mo:Dem Festival sound”. Hope you’re enjoying – I was while making it. Last two were much more to my liking, really nice, driving trippy psytrance. This isn’t what I expected – too slow for me, quite boring.. This is The Future! …Psytrance meets Tech Trance/Techno… take tilme to understand , to trip far away from normality and get yourself covered into intelligent abstract bass music.